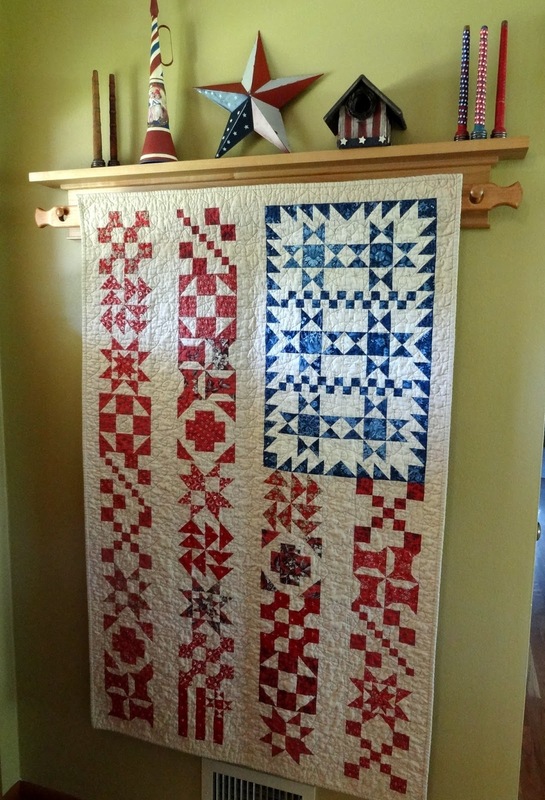 Squash House Quilts: Happy Independence Day! Mr. Squash, Sasha, Gracie May and I wish you all a wonderful Fourth of July with family, friends and good food! Lovely display. That quilt is just awesome. Happy 4th of July to all of the Squashes too, that includes the girls. Happy 4th to all of you! I was thinking of this very quilt this morning! Happy 4th to all of you at the Squash House! Your decorations are very nice and I love the quilt! Happy 4th of July to you and your furry friends. That is a beautiful flag quilt, most unusual. Let me tell you again just how much I LOVE that quilt!!! Happy Fourth of July to all of you, as well. What a beautiful flag quilt. Wishing you a lovely July 4 Independence Day. Oh how I love your quilt! Happy July 4th to your family too Candace. Wonderful display Candace to honor our country. HappyFourth of July. Happy Birthday America!!! Your flag quilt is flying! Love your decorations--especially those fun candles. Happy 4th! Oh I love this quilt :-) Have a happy Fourth! Long may she wave!! Love your flag quilt. Enjoy America's birthday. This quilt is fabulous!! Is it possible to purchase a pattern for it?